2019's Best TSA Approved Luggage Locks: What is a TSA Approved Lock? 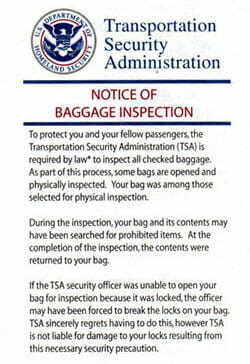 Whether you are a frequent flier or you only travel periodically, you know that there is always the chance that your luggage will be searched by the Transportation Security Administration (TSA). Because the TSA has to be able to open bags in order to search them, it has worked with two lock manufacturers—Travel Sentry and Safe Skies—to create TSA-approved locks that can be opened with a TSA master key rather than cut off and thrown away. These locks are sold under a wide range of brand names, so we’ve got our top picks for the best TSA-approved luggage locks. Our top pick for TSA-approved luggage locks is the Tarriss TSA Lock with SearchAlert. This lock uses a three-digit combination with easy-to-see white numbers on the dials and a large unlock button to open. It closes with a flexible steel cable, which is easier to thread through zipper tab holes than a rigid metal closure would be. Although TSA employees are supposed to leave a note if they search your luggage, the SearchAlert indicator on your lock turns from green to red if your lock is opened, giving many users a better sense of security. Tarriss locks come with a lifetime warranty and 100% satisfaction guarantee. 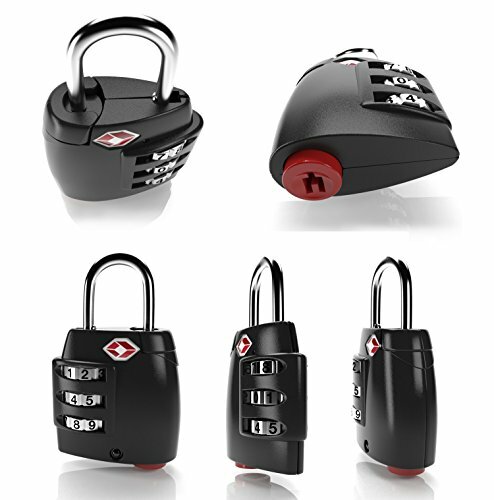 The lock has great reviews from users regarding the ease of use and durability of the locks, and the company has stellar customer service reviews. The only downside to this lock is that at two inches across, it is wider than some other locks, so it is more susceptible to getting caught in a conveyor belt—but that’s a risk you run with almost any lock you put on your luggage. 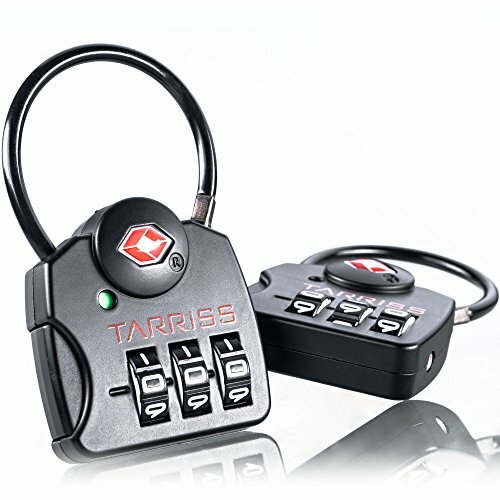 Overall, we found very little to dislike about the Tarriss TSA Lock with SearchAlert and a lot of things to love. Dimensions: 2 x 3 x .5 in. Another Tarriss lock earned the number-two spot on our list with many of the same features as our number-one pick. 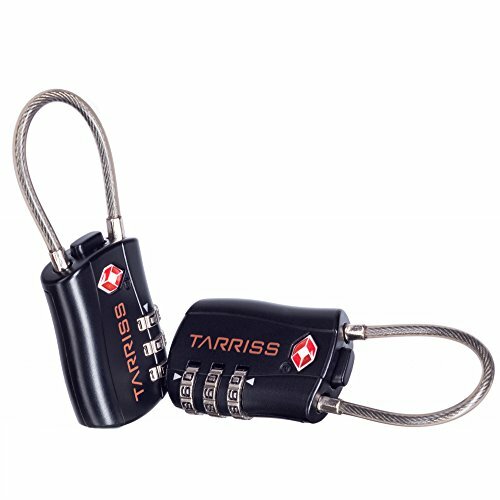 Like our first pick, this Tarriss TSA Lock uses a flexible cable closure, which is easy to thread through multiple zipper tabs, and the lock body is made of the same high-strength zinc alloy material. The three-digit combination is easy to reset, with a prominent unlock button. However, we missed the white numbers on black dials that were so easy to read on our number-one pick. Like any Tarriss lock, this TSA lock comes with a lifetime warranty and 100% satisfaction guarantee, in addition to excellent customer service. This lock does not have the SearchAlert feature, but the sleeker design makes it less likely to get caught on a conveyor belt. Dimensions: 1.5 x 3 x .5 in. 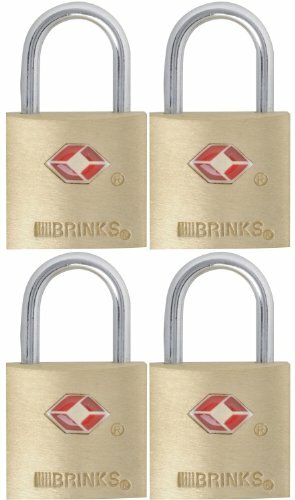 The Brinks TSA-approved lock has a standard padlock design and a solid brass body and comes with a lifetime warranty. All the locks in a package are keyed alike, so you don’t have to worry about matching up multiple keys and locks. Best of all, the lock is small and lightweight, making it much less likely to get caught and destroyed in a conveyor belt. The only downsides are that the metal closure is tricky to thread through the zipper tabs and, as is true with any keyed lock, you’ll be locked out if you lose the tiny key. However, if you want a simple, sturdy, and small luggage lock and don’t mind using a key, this is a highly recommended option. Dimensions: .75 x 1.5 x .5 in. The Acrodo TSA lock is a three-digit combination lock with a metal closure, which is harder to use than a cable closure. It includes an open-alert indicator that pops up when the lock is opened, letting you know if your bag has been opened. (The indicator is easily reset, but a busy airline worker is unlikely to take the time to use a pen or paperclip to do so.) This lock is made of steel and is solidly built. It is also a little bigger than some of the other locks on our list and is definitely heavier, which could make it more likely to be caught in a conveyor belt. However, you’re covered if that happens—the Acrodo TSA lock comes with a lifetime guarantee and warranty. Dimensions: 2 x 3 x .6 in. 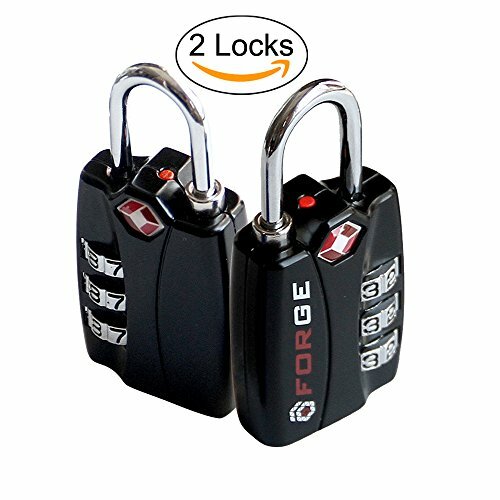 The Forge TSA-approved luggage lock is another keyed lock with a metal closure, which again lacks the flexibility of a cable lock. This lock stood out to us from the many similar locks on the market because it uses a dimple key, which is slightly more secure than a traditional key, and all of the locks in a package are keyed alike. As with any keyed lock, you have to keep track of a small key, but the lock does come with a lifetime warranty if you need a replacement key. Additionally, this lock requires a TSA agent who has opened the lock to relock it before removing the key, which makes it more likely that you’ll get your lock back. Several users report that this feature doesn’t work faultlessly, but it is a feature we felt set the Forge Dimple Key apart from similar locks and helped it earn a spot on our list. Dimensions: 1.25 x 2 x .8 in. If you tend to lose keys or forget combinations, you might try a third option for your luggage lock: a key card. 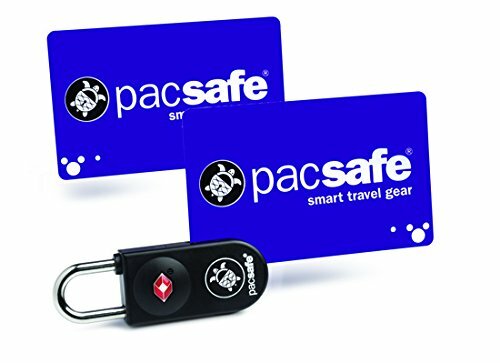 The Pacsafe Prosafe 750 requires a key card to unlock it. The key cards are the size of a credit card, so you can keep them in your wallet or with your other cards and documents. The downside is the same as using a key—if you lose the key card, you can’t open the lock, but keeping track of a card may be easier than keeping track of a small key. As a bonus, each lock comes with two key cards, so you have a backup in case one gets lost. Users report some difficulty with the cards getting stuck in the locks, and these Pacsafe locks come with only a five-year warranty instead of a lifetime warranty like the other locks on our list. However, if you’re more comfortable with a key card than a key or combination, this would be a good lock to consider using for your next trip. Dimensions: 1 x 2.8 x .4 in. Keep in mind that most luggage locks, while helpful in deterring theft, are not fully theft-proof, especially if you’re using soft-sided luggage that can easily be cut open. Thieves are likely to target easier, unlocked bags, so the best way to keep your belongings safe is to use a TSA-approved lock and keep any valuables with you rather than in your suitcase. The other main reason to lock your bags is to keep them from spilling open at any point on their journey. Zippers can get caught on other bags or in the conveyor belts, resulting in damaged luggage and belongings. The ultimate goal here is to keep your belongings safe and your luggage intact, and a lock can help you do that—as long as it’s TSA-approved.